If your child is having difficulty saying their sounds properly and clearly, they may need Speech Clarity and Pronunciation Therapy. As kids grow up, they develop their speech sounds, but sometimes they run into difficulties. They may be late in developing certain sounds. They could be making the wrong sound. They could be talking too fast, talking too soft, mumbling, or a combination of them all. You often ask your child to repeat what they’ve said. You find yourself translating for your child whenever they talk to other people. People often comment that your child is hard to understand. You can hear speech errors like them saying “wabbit” instead of “rabbit”, “dock” instead of “sock” or “nake” instead of “snake” or a lisp. 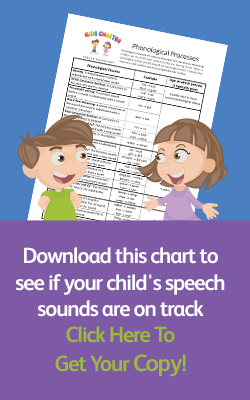 Your child is using some of the errors listed on our speech chart that you can download by clicking on the link on the top right side of this page or by clicking here. If your child experiences any of these, it’s probably time to bring them to Kids Chatter for an assessment. In this video, Monique explains what is normal and has some tips on what you can do to help them with their speech development. We’ll start by having a chat with you to find out what aspects of your child’s speech you’re having trouble understanding (or have been told about by other people). Then we’ll talk to your child and get them to name a range of pictures and answer questions to check whether they can articulate all the speech sounds correctly for their age group. Then we’ll see how they use those sounds in everyday spoken language. If the results indicate that they need therapy, we’ll teach them how to make the sounds correctly. 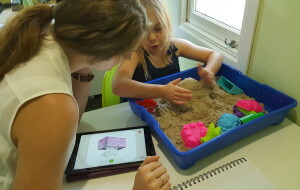 We then go through systematic steps to teach your child how to say their new sounds in all positions of small words, small phrases, and finally longer sentences and everyday communication. We don’t always expect them to be able to produce all the speech sounds. In some respects, they’re age-dependent, as some sounds are harder to produce than others. If they’re beyond the age where we expect that sound to have developed and they can’t produce it or they are still swapping sounds in their talking beyond the expected ages, then we can teach them how to make those sounds. As children’s speech and language skills develop, they start using longer and longer sentences, but if they can’t articulate their sounds correctly, they will become harder and harder to understand. Once they reach school age, it can affect their ability to read and spell as they are saying the wrong sounds in their speech, which means they may soon face a literacy problem as well. They may also have trouble making friends with other children because they have difficulties being understood, because they sound different to other children or because other children think they talk “like a baby”. By bringing them to Kids Chatter, we can correct the problem. They will be able to communicate with everyone they interact with—relatives, teachers and friends—without being misunderstood. If you feel that speech clarity and pronunciation may be holding your child back, please call us today to discuss your child’s needs on 0432 735 044.